The French town of Cherbourg is a truly historic & cultural place. 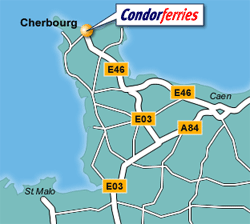 Why not pay it a visit by taking one of our magnificant ferries from our Portsmouth Terminal.Condor Ferries Cherbourg Terminal is easily accessible and offers a range of facilities. Our services operate between Cherbourg and Portsmouth on Sundays during the summer months. Take a look at the Cherbourg Destination Guide and Cherbourg Ferry Times. Cherbourg is a truly beautiful little french town filled with history, tradition & culture.There is a wide selection of shops in Cherbourg, as well as several hypermarkets located just outside the town, where you will find cheap prices on a range of goods. Cherbourg also hosts a market every Thursday in the town centre. Cherbourg is located at the tip of the Cotentin Peninsula and is the gateway to the popular region of Normandy.La Cité de la Mer, Cherbourg’s aquarium, allows visitors to explore the depths of the ocean. It offers a fantastic journey showing the many facets of underwater exploration, with human exploration as its main theme. The submarine section contains the largest submarine in the world open to the public. Mont St. Michel, a world heritage site is a must see on your visit to Cherbourg. The Gothic-style Benedictine Abbey is perched on a rocky islet in the midst of vast sandbanks exposed to powerful tides between Normandy and Brittany. One of the oldest city sights in Cherbourg is the impressive Holy Trinity Church. It has had a very interesting and dramatic history dating right back to the early fifth century. The deep water port of Cherbourg is at the entrance to the English Channel located in Normandy.Cherbourg is home to several large and interesting museums. Among the most impressive is the Liberation Museum, and it is housed in the fort on the Rontagne du Roule, which was built between 1852 and 1857. Overlooking the harbor, the fort was the scene of bitter fighting during the liberation of Cherbourg in June 1944, following the D-Day landings. The Northern France town of Cherbourg has a long maritime history, and is the setting for numerous boating events throughout the year. Cherbourg has a culture that is truly French but features unique influences, including an Italian-style theatre, various art galleries, abbeys and churches. The arts are very important in the town, which is evident from the annual Cherbourg Film Festival which exhibits foreign films not currently distributed in France. The city’s oldest museum is the Natural History and Ethnography Museum, housing a collection by François-Henri Duchevreuil, an amateur archaeologist, and includes collections of shells and artifacts from Egypt, Asia and Greece.